Speedball 2 is one of the best loved games of the early 90s 16-bit era, and now a shiny HD remake is coming to PCs on December 5th. The futuristic sports game plays a bit like handball, but as well as scoring points for goals, you get points for violently knocking out opponents. The cut 1970s futuristic sports film Rollerball is obviously an influence too. 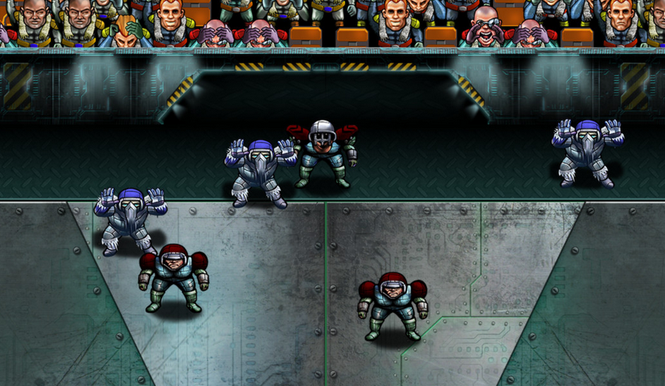 Speedball 2 has been re-released a few times since 1990, most recently on iOS. While that version got lots of things right, the game never suited touch screen controls. The new PC version is developed by the same team as the iOS version, Vivid Games, and directed by veteran UK developers Jon Hare (of Sensible Soccer fame) and Mike Montgomery (from original developer The Bitmap Brothers). Speedball 2 HD keeps the 2D graphics, instead just polishing the original graphics and adding some sparkle to the backgrounds. It features local multiplayer only, perhaps staying true to its origins, but it feels like a missed opportunity not to have online multiplayer.